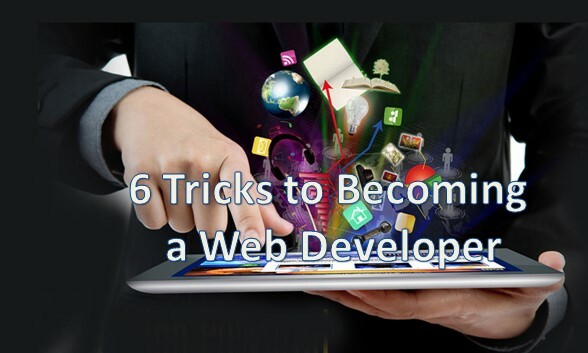 Today I talk about Tricks to becoming a web developer So it's simple article that where you can get some tricks about web development. Don't get me wrong it can make you an interesting well-read person and I definitely recommend going however and here's the important part a college degree is not a requirement for a career web development. there are many online resources where you can learn web development skills most are low cost some are even free. The fact is no one is going to ask to see your degree even where they hire you for web development work, some large companies do require a degree to get in the door but for many, it's all about the skills you have and the work you've done. In other words, employers are looking for talent and experience rather than a degree. it's important to take these jobs for two reasons first you'll gain valuable experience to put on your resume second you can earn some extra money to fund your education. There's no reason to enroll in courses that you have to travel to all the necessary courses can be taken online, online courses are generally inexpensive, convenient, and taught by working experts in the field. even YouTube has hours of free educational content that can help you learn important web development skills. There are dozens of programming languages on the Internet out there but guess what many of them have the exact same function they just implement it in different ways your goal shouldn't be to learn many web development languages but to instead master one complete set of languages. CSS allows control of everything from typography and layout to transitions and animation I guarantee if you dedicate some extra time to mastering the CSS language it will give you an advantage over the competition whether you're working as a freelance developer or trying to work in a professional studio. Web development has the lowest barrier to entry of any well-paying profession barriers to enter your obstacles that stand in your way when you try to enter a field. it's easier to get a job as a customer service representative than it is to get a job as a teacher or technician. if you have a portfolio of work that shows quality start saving everything you do in a work portfolio you'll be glad you did when you can show it to a potential employer.